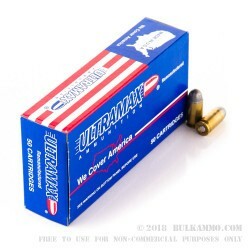 Ultramax ammo is offering these cases of 45 ACP (Auto Colt Pistol) ammunition for a price to good to pass up. The cases come packed in boxes of 250 rounds each, ready to take to the range and shoot. 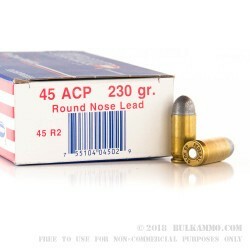 They feature Lead Round Nose 230 grain bullets with remanufactured Boxer Primed reloadable brass cases. 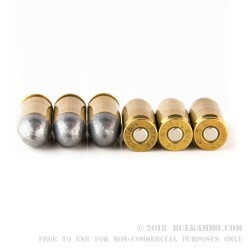 The Ultramax 230 grain 45 ACP (product # 45R2) has a muzzle velocity of 760 feet per second which keeps this round in the subsonic ammo category. Ultramax employs a remanufacturing process that incorporates a 10 point quality check to provide their customers with a well-made product again and again. Founded in 1986 and based in Rapid City South Dakota, Ultramax ammunition has worked hard to keep prices low while putting out a high quality product. These ingredients are what keeps them one of the leaders in the value priced ammunition market. 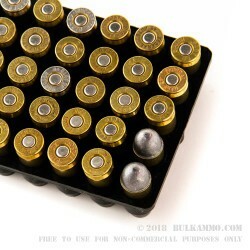 With these cases of 250 rounds being offered at such a good price, you can easily get 2 or 3 for your next trip to the range. NOTE: Always check your firearm manual to be sure you can fire non-jacketed, lead only bullets through the barrel.